I have a high bar for children’s music, because I know that whatever I let them listen to could potentially become the soundtrack of my life for several years. So, now that the snobbery is out of the way, here are my recommendations! 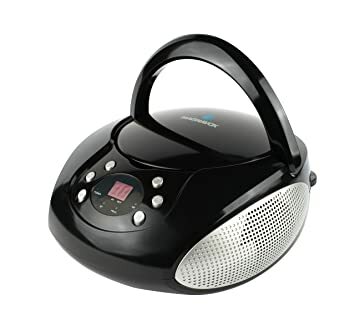 Magnavox CD Boombox – I might be heading into Old Fogey territory, but I still feel like CD’s are still the most user-friendly format for kids. My 2-year old and 5-year old can easily operate this CD player, and it also has a bluetooth option so you can play music from your phone. Putamayo CDs World music makes a great soundtrack to your day, and Putamayo has CD’s from every country to fit any mood. I’m particularly a fan of their Dreamland series; I have Dreamland, Celtic Dreamland, and Acoustic Dreamland. Animusic, Animusic 2 Even as someone who thinks TV is the devil, I LOVE THESE DVDS SO MUCH. When I was a classroom music teacher, every year my students would BEG to watch “The Robot Movies” on the last day of school. Now, my own kids are fascinated by the futuristic concept instruments and the excellent soundtrack (also worth purchasing!) My son actually wanted to be an Animusic Robot for Halloween last year! Both of my kids love to set up their drums on the couch and play along with the videos. Baby Signing Time Series Each DVD uses catchy songs to teach a collection of signs that are useful for parents and babies; food, toys, pets, family, feelings, and others. The music videos feature a diverse group of toddlers demonstrating the signs. Rachel Coleman, the creator of this series, was a professional musician who found out that her baby was born deaf. She has since dedicated her career to making ASL accessible to families, and advocating for the special-needs community. She writes and performs all the music on the DVD’s. Illustrated Songs Why read a story when you can sing a story? West Music has a great collection of books based on songs, and many come with CD recordings included. Music Together also has a collection of “Sing Along Storybooks,” featuring some of the songs from class.